Ingredient-driven, seasonal American cuisine in Old City. 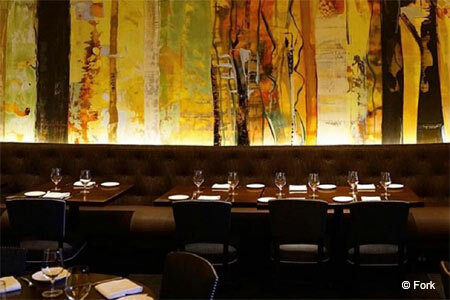 : Under the direction of chef John Patterson, Fork’s signature creative American fare emphasizes house-made pastas and Mid-Atlantic ingredients. The meal might begin with hand-torn scallops with carrots and buttermilk; lamb tartare with fermented kohlrabi; or a seasonal salad, such as watermelon with green coriander yogurt. The black pepper malfatti with fava beans and charred scallions is not to be missed. The wine list emphasizes American pours designed to complement the cuisine. Designer Marguerite Rodgers' muted color scheme of greens and golds has been amplified by a pair of colorful murals of trees --- accomplished while leaving intact the historically certified building's high ceilings and cast-iron columns. The lounge area at the front, with its concrete bar, is popular with singles as well as couples. Partners Ellen Yin and Roberto Sella are gracious hosts and the service is usually topnotch.